What a pretty card! I love the neutral colors and the clever way in which you covered the "seam." Thanks for joining us at Freshly Made Sketches this week! Wow Karren - this really is my kind of card. I love the colours and your shells are genius! Fabulous card Karren! I love these colours and those shells are perfect for this card! Love the flags! Thanks for joining us this week at Freshly Made Sketches! Karren this is a fabulous Father's Day card! 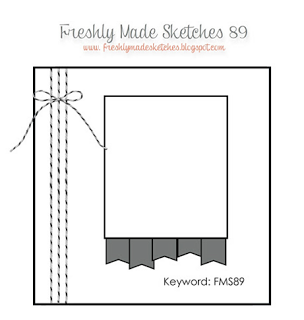 Love how you're showcasing your new goodies - mine didn't come yet :( Thanks for joining us at Freshly Made Sketches this week! Extraordinary! I love every detail!! Your shells are amazing! Glad you joined us this week at FMS! LOVE this card, Karren. Isn't Baked Brown Sugar a fabulous colour? Love the DSP flags, and your use of washi tape. A great sophosticated FD card. Love it!